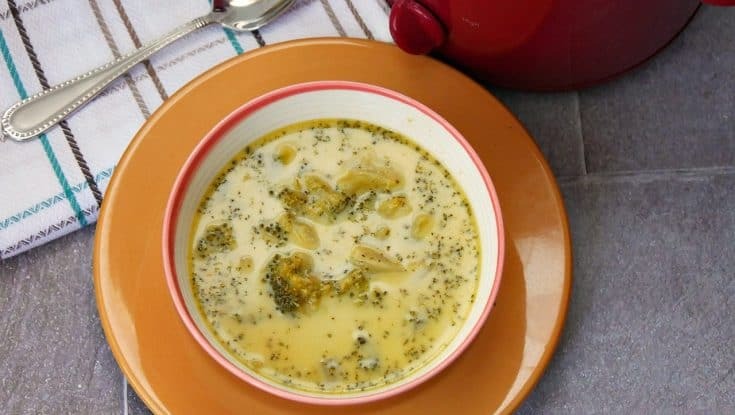 Easy broccoli cheese soup is made with fresh broccoli and no canned soup or processed cheese. 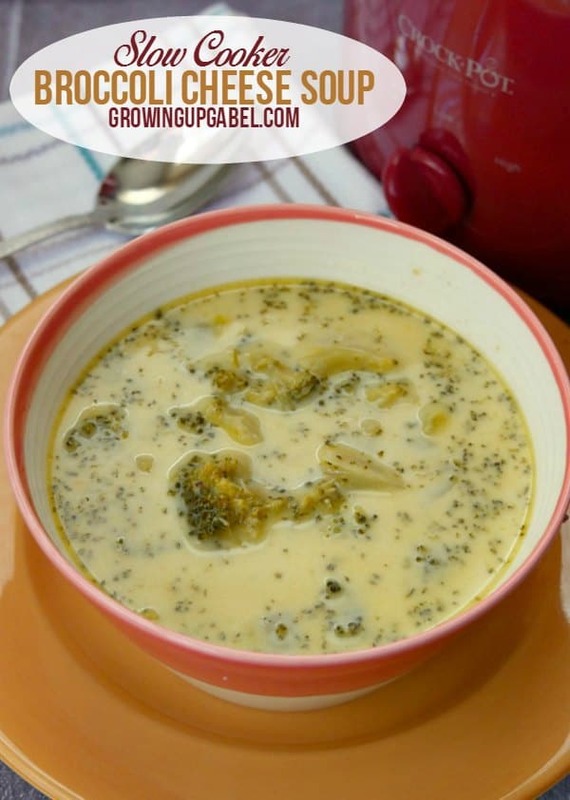 Broccoli cheese soup is one of my all time favorite soups. I usually make cheese and broccoli soup on the stove top. I've been wanting to make it in the slow cooker, but I wasn't sure it would work. 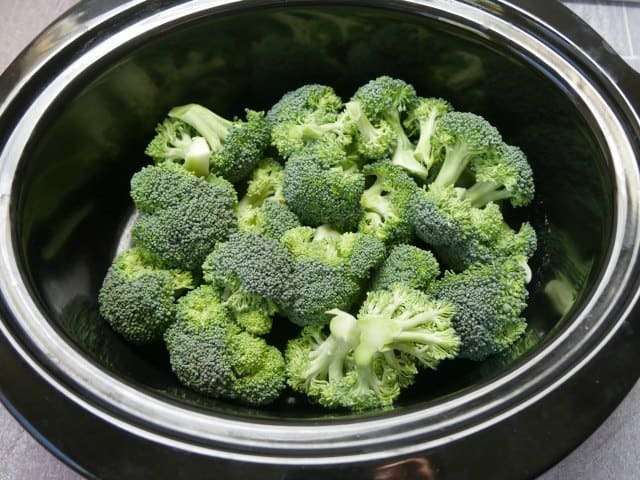 Most of the broccoli and cheese soup recipes I've seen for the slow cooker call for either canned soup or processed cheese. Now, I'm not afraid of a little processed cheese, but I see no point in making a homemade soup recipe that calls for canned soup. I also rarely have processed cheese on hand, but I almost always have a block of cheddar or some other kind of cheese in my fridge. I wanted a recipe I could make without having to run to the store for one ingredient. The soup starts by cooking the broccoli and some other veggies in chicken broth. I was afraid the broccoli would get mushy, but it didn't. It got just soft enough to be perfect. Once the broccoli is cooked, use an immersion blender to cream it a bit. I like big chunks of broccoli in my soup so I left a lot of the vegetable whole. But blending it helps add a little thickness to the soup. I'll be honest that this soup is not a heavy, thick creamy broccoli soup. It had more of the consistency of chicken noodle soup. But it was still delicious! I did use half and half in place of the heavy whipping cream so I think using the cream would make the soup thicker. And of course if you add some processed cheese, that would also help to thicken it a bit. I promise not to tell! 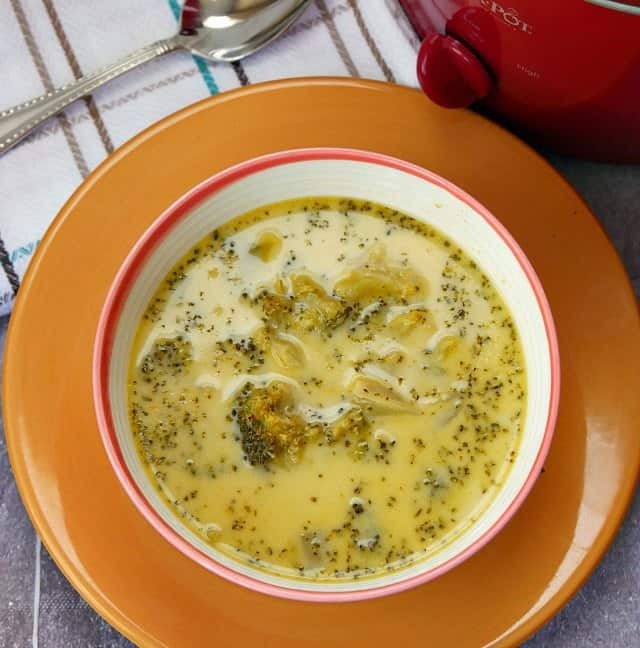 Feel free to substitute cauliflower for the broccoli for a twist on this soup recipe! Put first 4 ingredients in a 6 quart slow cooker. Set slow cooker to LOW, cover and cook for 7 to 8 hours. When done cooking, use an immersion blender to puree the mixture in the slow cooker, or remove mixture to blender and blend until smooth. Return to slow cooker. Feel free to leave the veggies a little chunky as well. Turn slow cooker to HIGH.Add the cumin, Worcestershire sauce, heavy cream, and shredded cheese, stirring until mixture is hot and cheese is melted. Taste and season with salt and pepper as needed. 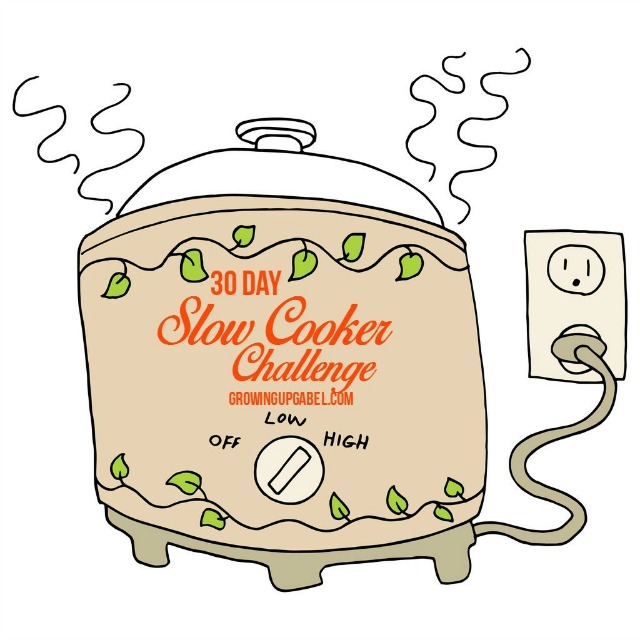 Make sure to check out all the recipes in our 30 Day Slow Cooking Challenge! I was really excited to try a broccoli cheese soup in the crockpot! Everything went great until I added the shredded cheese and it is a stringy and clumped together. It has been on high for the last 35 minutes and still no complete melt. Should I have used like a velvetta cheese? Tips for next time would be appreciated. Thank you. Yeah, using shredded cheese can be a little touchy at times. Sometimes it’s just the cheese. I find some store brands just don’t melt well. Next time, turn the slow cooker off and take the lid off. Let it sit for a few minutes then add in the cheese and other ingredients and stir. It will not be thick and creamy like a Velveeta (although you could certainly try using that!). This is a thinner cheese soup. I love Broccoli Soup and your recipe looks delicious. I love that it is for the Slow Cooker, just put it in the pot and when you come back it is ready to go! Thanks so much for sharing your post with us at Full Plate Thursday. Have a great week and come back soon! Looks great! Thanks for sharing at the What’s for Dinner Party. Broccoli and Cheese soup is always so good. Your recipe sounds delicious. Sharing. Thanks for sharing with us at Merry Monday. We love good food! It’s cold and snowy in my part of the world, and soup is perfect. Broccoli cheese soup is one of my favorites. I’ll be trying this one. Thanks for sharing on Sunday’s Best. This is one of my favorite kinds of soup, you just made my day so much easier with this !!! This is going to be great ! I love to cook in the crock pot. I would love to get more recipes for slow cookers! Thanks! I will work on that in the new year! Thank you for sharing your recipes. They are easy & yummy. Makes my life better. Slow cookers are the best for today’s busy world.